Hospitality Marketing Concepts is the only F&B loyalty program provider who can orchestrate a true multi-channel digital experience for your members. If your loyalty program is still reliant on printed paper vouchers and old-fashioned plastic cards, let HMC usher your loyalty program into the digital era. Our suite of tech-savvy mobile apps lets members redeem digital vouchers, receive location-based push promotions, reserve a table and much more. 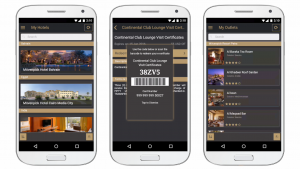 Best of all, HMC’s loyalty apps are white-labeled so they can be tailored to any hotel’s unique needs and brand. Members can download HMC’s apps to their smartphones in iOS or Android platforms. To learn more about how we’re helping hotels interact with members across multiple digital channels, and how HMC can provide your hotel with an incredibly effective marking strategy backed by our proven solutions, please complete the form on this page to learn more. Find out why world-class groups like Hilton, Shangri-La, Fairmont, Mövenpick, Marriott, Hyatt and numerous iconic 5-star independent hotels have selected to partner with HMC. Next: Watch a demo of HMC’s mobile app.